Yesterday I traveled to Hartford, CT to meet my husband who is there for work. While waiting in line to check my luggage, I looked around me to absorb the excitement one always finds at airports; the hustle and bustle of people hurrying to catch their flight, people being happy to leave, people being sad to leave. And as I am watching this all, my mind wanders off to that grey and dreary day in April of 2005 when I left the Netherlands. Come with me as I start the series “Following my Heart” in which I tell you the story of my travels throughout the United States of America and how and when I became a knitter. 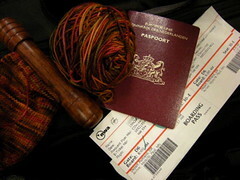 It was a grey and dreary day that day in April of 2005 when I left the Netherlands. As always, Amsterdam Airport Schiphol was packed with travelers and I remember feeling the fast whirling energy of people on the go, nervous yet exciting arrivals and nervous yet sad departures. Three beautiful ladies accompanied me to the airport to bid me farewell: my mom, and my two best friends Wally and Cartoon. We were giggly and giddy, not because we were happy but because we were nervous and we tried to push away our final goodbye as far as possible. Wally with her long curly hair, petite as she was yet a grand personality, kept on looking at me with her big brown eyes and bravely tried to hide her sadness. Cartoon, who always has a naughty twinkle in her eyes, kept on holding me, resting her head on my shoulders while her long black hair tickled my cheek. And my mom, her darkbrown eyes soft and friendly smiled as she watched the three of us. It was with pain in my heart when I decided to leave them, but there was a great joy for the reason why: to marry the man from New York City who I had met in August 2001. When we no longer could postpone our farewell, we slowly walked to the security gate. How bravely they all pushed away their tears when I started to cry. They were strong, to make it more bearable for me. We hugged for the last time and as I walked away I looked back one more time. All of a sudden, everything became silent, the busy sounds of the airport died down, and there was only me, Wally, Cartoon and my mom. Motionless I stood there for several seconds as if I wanted to freeze this moment in time. My mom broke the spell by gently saying: “It’s okay, dear… you’d better go now”. I nodded… and walked away. When my plane took off I just could not hold it together anymore and I cried so loud that the poor passenger next to me started to panic and so cutely tried to comfort me. “I am leaving my best friends and family”, I loudly sobbed as he petted my hand. My family and friends knew I had to follow my heart. They knew that there was no other way for me. And allthough they love me dearly, and did not want to see me go, they so unselfishly accepted my departure, supported my choice and let me spread my wings. There is no greater and no more unselfish love than that. Socks are perfect for traveling! 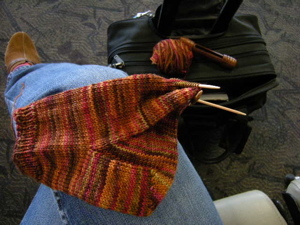 While I knitted at the Pdx Airport waiting to board, I chattered away with two ladies I had befriended while waiting in the check in line. When one of them, told me she owned an Alpaca farm in Tuledo, Washington I nearly peed my pants and shouted “Really??? I am a knitter!” Needles to say, we had a lot to talk about. My trip was long yet very pleasant because of my nice fellow travelers. I wore my textured tunic and got a lot of compliments by women! Even a guy made a nice comment. I was so proud to say: “I made it!” And smiled from ear to ear as I saw their eyes grow bigger in disbelief. But the best compliment I got was from my husband. When I met him at his hotel, he just gasped at my tunic and gave me a big warm hug. So now I am in a nice hotel somewhere in Hartford, CT. 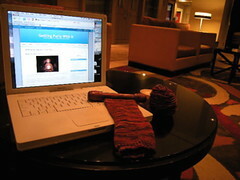 If you see a lady knitting away in the lobby, with a laptop on her side, come say hi. It most likely is me, Nancy from Getting Purly With It! Thanks again and untill the next entry! This entry was posted on Friday, November 16th, 2007 at 7:13 pm and is filed under Following my Heart, Knitting, Socks, WIP, Yarn. You can follow any responses to this entry through the RSS 2.0 feed. Both comments and pings are currently closed. You must miss your mother very much ! And she you offcourse, it must have been very hard for her to see you go. But knowing that you are happy with DH sure must make up for the fact that she won’t be able to see you that much’.